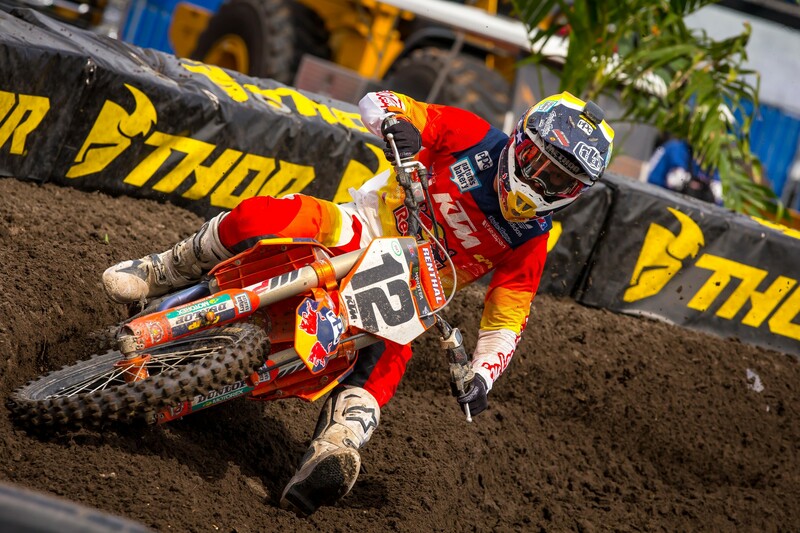 Troy Lee Designs/Red Bull KTM’s Shane McElrath finished 12th in his 2019 450SX debut at the Daytona Supercross on Saturday. In the 250SX West Region, McElrath currently sits third in the points standings, however, he rode in 450SX due to injuries to both East Region riders, Jordon Smith and Mitchell Falk. With limited time before the Daytona Supercross, McElrath rode his 250 SX-F instead of jumping onto a 450 SX-F.
Our Steve Matthes caught up with McElrath after the race. Racer X: I thought you were nutty to ride a 250cc in the 450SX, and especially this place. How was it? Shane McElrath: Honestly, I’ve heard that a lot. Me, I don’t really see it that way. I see it as a big challenge, but there’s not really a goal. There’s not really an expectation. It’s just go and ride as hard as I could. I felt like I did pretty good. I kept pushing. The track was pretty rough, but I really felt good on the bike. That was kind of what I was excited about. I think I ended up 12th. Like I said, if I’m being honest I would have wanted a top 10, but I kept telling myself, I don’t want a certain position. I just want to go and fight. So I’m happy with it. I was watching you a little bit. It didn’t look like you were really getting yarded that bad. I don’t know if it was the softness of the track or you staying up, able to get up on top. I felt good, it was just all in the start. The heat race start, I can’t get a jump on those guys to cut anybody off. But the main I actually beat one dude, but everybody else still swallowed me up. Then the sand pit right after that, it didn’t play me any favors. I couldn’t really expect much out of that. Just tried to get through as clean as I could. You’re in good shape. You train hard. But did you notice the extra little bit of time? Not really. I don’t know if it’s maybe just the longer track. It was definitely... after I came off it felt like I had kind of done an outdoor moto but it wasn’t like really that much different than ours, I didn’t feel like. I don’t know how much you were thinking about it, but obviously you’ve got a title on the West that you’re still in. Does that come into your mind at all? Like, "Hey, maybe I should just be careful about that?” You’re a racer also, too. Yeah. I’ve kind of been thinking about that a little too much. That was something with deciding to do this race. KTM just asked me if it was something I would want to do and they were like, don’t feel like you have to. I’m like, no, I want to do this for me. I feel like I’ve thought about it a little too much and that’s what I’ve told myself. I’m not going to be scared anymore. I don’t care. Lining up here against all these guys, it’s like just throwing it on the line. I don’t know who’s to my right or to my left, but I’m not scared. It was a good job. It was interesting to watch you and see how you were doing. It added a little spice to the race. Nice work.